Wind power is the conversion of wind energy into a useful form of energy, such as using wind turbines to make electricity, wind mills for mechanical power, wind pumps for pumping water or drainage, or sails to propel ships. At the end of 2009, worldwide nameplate capacity of wind-powered generators was 159.2 gigawatts (GW). Energy production was 340 TWh, which is about 2% of worldwide electricity usage and is growing rapidly, having doubled in the past three years. Several countries have achieved relatively high levels of wind power penetration (with large governmental subsidies), such as 19% of stationary electricity production in Denmark, 13% in Spain and Portugal, and 7% in Germany and the Republic of Ireland in 2008. 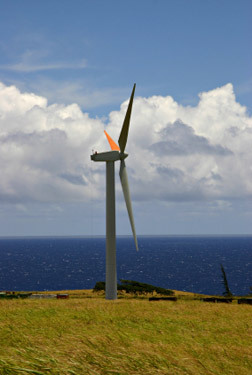 As of May 2009, eighty countries around the world are using wind power on a commercial basis. Large-scale wind farms are connected to the electric power transmission network; smaller facilities are used to provide electricity to isolated locations. Utility companies increasingly buy back surplus electricity produced by small domestic turbines. Wind energy as a power source is attractive as an alternative to fossil fuels, because it is plentiful, renewable, widely distributed, clean, and produces nogreenhouse gas emissions. However, the construction of wind farms is not universally welcomed because of their visual impact and other effects on the environment. Wind power is non-dispatchable, meaning that for economic operation, all of the available output must be taken when it is available. Other resources, such as hydropower, and standard load management techniques must be used to match supply with demand. The intermittency of wind seldom creates problems when using wind power to supply a low proportion of total demand, but costs rise as does the proportion.